Contact your Payroll Liaison to receive a shortcut to open your account today. Paystub history available for re-print at all times. Access your payroll stub 24 hours before payroll. Receive texts and email messages when banking changes occur and when payroll is ready. Cell Phone application available for smartphones. Claims for receipts of 1/1/2017 thru 12/31/2017 can be submitted by 3/31/2018. Adjustments or dockings to salary should be discussed with payroll department for accuracy. 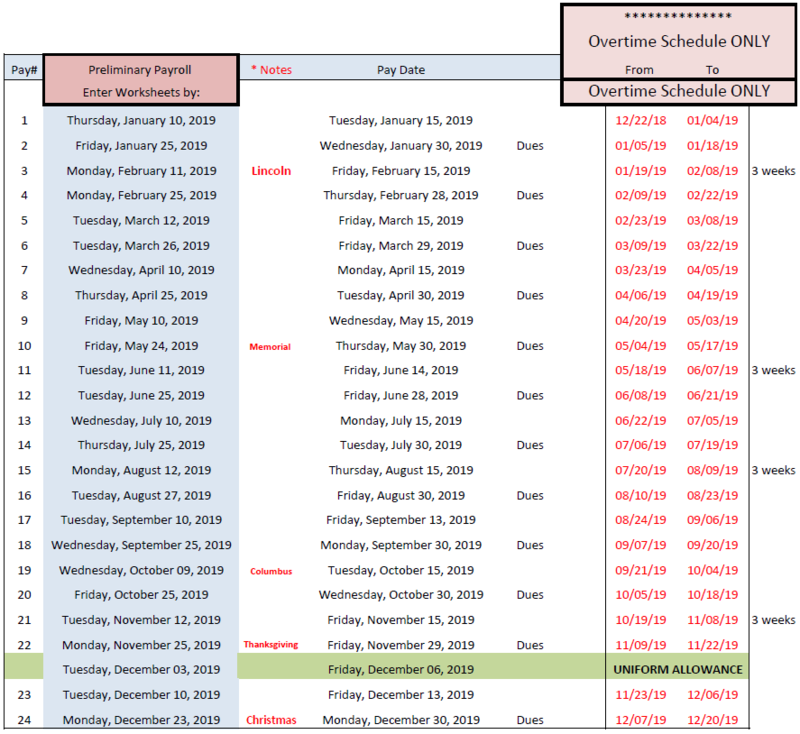 This Overtime Schedule from and to dates are for Overtime ONLY. Overtime Schedule NOT to be used as representation of an employees pay for regular salary Salaried employees are paid 24 times a year each pay representing 1/24 of their annual salary. Retirement Seminars and Webinars take a step-by-step approach to the retirement process and explain what happens after you submit your application. We explain your benefits, survivor options, group life insurance, loan repayment provisions, and the taxability of your pension. There is also a brief discussion of State Health Benefits Program and School Employees’ Health Benefits Program coverage in retirement. If time permits, sessions conclude with a question and answer period. Departments, Offices and Agencies of the County of Union shall obtain written permission from the County Manager and the County Treasurer for all locations that receive monies on behalf of the County of Union. Please file requests prior to the commencement of receiving monies in each calendar year. All moneys received from any source by or on behalf of the County of Union shall within 48 hours after receipt be turned over to the Department of Finance, Division of Treasury. All receipt of funds must be entered in a cash receipt journal. Duplicate Pre-numbered cash receipts shall be utilized. The original receipt shall be issued to the payer. The receipt copy shall be retained by the Department. Departments shall maintain a cashier log including the following information: date of collection, receipt number(s), total amount of funds collected, name of the cash handler, name of the depositor, license/permit number, and the date funds were remitted to the Department of Finance, Division of Treasury. It is imperative that all receipts relate to a transmittal and that all transmittals be directly traced to an entry in the cash receipts journal. The Revenue Deposit template, provided by the Department of Finance, Division of Treasury, should be placed on Departmental letterhead and accompany each deposit. The template is sent under separate cover. The Department of Finance, Division of Treasury is responsible for depositing all funds received within 48 hours into a GUDPA certified depository as outlined in the County of Union’s Cash Management Plan. Departments should utilize the invoicing module in the Edmunds system to assist in collecting and identifying funds due to the County. All funds must be properly secured during and after business hours in a locked cash box, preferably a fireproof safe, to prevent Funds are to be secured on County property. Funds are never to be taken home or stored at a private residence or in a motor vehicle. All cash operations are subject to review by the County of Union’s external auditors and the Department of Finance’s internal auditors – reviews may be scheduled or unannounced. Petty Cash is a method to facilitate small claims; not an alternative source of funding. Therefore, petty cash cannot be used to circumvent controls or to pay expenses which are to be paid through the normal accounts payable cycle. All Petty Cash Funds are established by the Board of Chosen Freeholders subject to approval by the NJ Director of the Division of Local Government Services. Use of petty cash funds must conform to requirements for budgetary sufficiency of funds and all other pertinent County controls. All expenses must be promptly listed on a purchase order and submitted to the Department of Finance, Division of Comptroller for reimbur Purchase Orders must include original invoice(s) for documentation to be reimbursed and must be signed by the custodian of the fund. Petty cash must be properly secured during and after business hours in a locked cash box, preferably a fireproof safe, to prevent Funds are to be secured on County property. Funds are never to be taken home or stored at a private residence or in a motor vehicle. The fund must be available during business hours for review by the County of Union’s external auditors and the Department of Finance’s internal auditors – reviews may be scheduled or unannounced. The following are examples of disallowed petty cash expenses. Some extraordinary circumstance may occur which may require use of petty cash for the cited disallowable expenses. In these instances, the Custodian’s best judgment must be used in determining utilization of petty cash. No other cash or refunds are to be commingled with petty cash. Refunds of expenses must be forwarded to the Department of Finance, Division of Treasury with indication of the account to which these refunds should be credited. All petty cash expenses must be charged to an account in the County Budget. This is to be accomplished by listing the accounts on the Purchase Order submitted to the Department of Finance, Division of Comptroller for reimbursement. All petty cash funds must be closed at year end. At that time all cash in the fund must be remitted to the Finance Department, Division of Treasury. In addition, all expenses must be forwarded to the Department of Finance in Purchase Order form. For any Purchase Order already submitted but unpaid, a photocopy of the purchase order must be forwarded along with the cash. The total of the cash and the Purchase Order must equal the amount of the fund. In addition, a statement must accompany the funds stating the fund is closed and that all funds are accounted for. Copies of this statement will be issued for your use at year end. See the attached Petty Cash Statement Form. Custodians of Petty Cash Funds are designated by resolution of the Board of Chosen Freeholders and are responsible for ensuring that the above procedures are followed. Any changes to the Petty Cash Fund, such as increases, purpose of the fund or change in Custodian must be authorized by resolution and approved by the NJ Director of the Division of Local Government Services. A Change Fund is established to make change at various County service locations involving cash transactions. Change Funds are NOT to be used for petty cash purposes or reimbursement of expenditures. Change Funds shall not be commingled with revenue collected by or on behalf of the County. Change Funds must be properly secured during and after business hours in a locked cash box, preferably a fireproof safe, to prevent loss. Funds are to be secured on County property. Funds are never to be taken home or stored at a private residence or in a motor vehicle. Change Funds must always equal the amount authorized by the Board of Chosen Freeholders. Custodians of Change Funds are designated by resolution of the Board of Chosen Freeholders and are responsible for ensuring that the above procedures are followed. Encumbering funds appropriated at the time contracts/commitments are authorized insures that the funds allocated for such purposes are reserved and cannot be used for other charges within that line item. Departments shall encumber amounts appropriated for “Other Expenses” by entering a requisition in the Edmunds Financial System simultaneous to requesting the Board of Chosen Freeholders adopt a resolution approving a contract for goods and services. The requisition number shall be entered into the Financial Impact Section of Minutetraq. Resolution requests not accompanied with the requisition number will not receive a certification of availability of funds. Upon adoption of a resolution by the Board of Chosen Freeholders, a Purchase Order for goods and services can be issued if all approvals are granted on the Departmental level and meets the approval of the Division of Purchasing. Exception – While operating on a Temporary Budget, Departments shall encumber a prorated share of contracts/commitments to reflect the temporary appropriations so authorized in the Edmunds Financial System. Upon adoption of the CY Budget, Departments shall fully encumber the contract/commitment. Please Note: The Financial Impact Section of Minutetraq should always reflect the full contract value. If a purchase or the execution of a contract does not require adoption of a resolution of the Board of Chosen Freeholders, then the individual requesting a purchase shall obtain a duly authorized Purchase Order prior to placing an order for goods and services. Attached for reference is a guide on Purchase Order Requirements; however, please refer to the County’s Purchasing Manual for full guidance on purchasing procedures via the UC Employee Intranet. All Departments, Offices and Agencies of County Government shall utilize the Edmunds Financial System to drawdown on Open Purchase Orders instead of submitting typed vouchers. Utilizing the Edmunds Financial System for all purchases insures that the Department Head and the Division of Purchasing approves of partial drawdowns for additional goods and/or services while simultaneously insuring that adequate balances exist on open Purchase Orders. Click Add. The next available requisition number will default. Click Ok. Complete Vendor, Description and Shipping Information. P.O. Type: Menu options are New Blanket or Existing Blanket. Select Existing Blanket. Click Save. Click Line Item on Requisition Maintenance Screen. The Requisition Line Item Maintenance Screen will appear. Enter detailed Line Item Descriptions, Account Number, Unit Price, Quantity and Invoice Sections. *** To alleviate potential delays in acquiring goods and services previously authorized under an Open Purchase Order, Department/Divisions may with the approval of their Department Head place the order after entering the requisition in the system and receiving all requisition level approvals but prior to receipt of the Purchase Order from the Division of Purchasing. NOTE: This exception only exists for drawdowns on Open Purchase Orders. Please contact Linda Ferraro at ext. 4059 to schedule training for staff, should same be needed, prior to the full implementation of utilizing the Edmunds System to drawdown on Open Purchase Orders. The Department of Finance processes accounts payable checks weekly. Checks are released for mailing every Friday after 2:00 p.m. to the payee. No bill, demand or claim shall be paid unless a detailed statement of the terms or demands, specifying particularly how the bill or demand is made up, and a certification of the party claiming payment that it is correct. Nor shall any bill, claim or demand be paid unless the Purchase Order on which it is presented carries a certification of the Head of the Department, Office or Agency and another duly designated departmental representative having personal knowledge of the facts that the goods have been received by or the services rendered to, the County. Departments shall update their authorized signatories with the Department of Finance, Division of Comptroller prior to the beginning of each calendar year and as changes in signatories occur. In consultation with the Department of Administrative Services, Division of Purchasing all Purchase Order requirements are met based upon aggregate pricing thresholds. Checking pricing on the bill, demand or claim against the authorized Purchase Order to insure same is reflected in the approved contract. Checking the math on the bill, demand or claim to insure totals are accurate. Vendor name and information on the bill, demand or claim corresponds to the information on the Purchase Order. Budget appropriation accounts charged for goods and/or services shall correspond to the budget year in which goods and/or services are required. (i. Departments cannot charge a CY16 account for CY17 activity). The source of funds advanced is a Federal grant allowing the County to receive funds in advance of disbursement and requiring that any interest earned on said funds shall be returned to the Federal Government. The Board of Chosen Freeholders adopts a resolution authorizing the advance and the purpose of the advance is to meet service program start-up costs and prevent an undue hardship to the nonprofit organization or agency in achieving the objectives of the Federal grant. The amount of the advance to any given nonprofit organization or agency does not exceed an amount equal to the total amount of the contract with the nonprofit divided by the number of months in the term of the contract. Further, the total disbursements including the amount of the advance outstanding shall not at any time exceed the total cash receipts of the County under the Federal grant up to that time. The resolution authorizing the advance includes a schedule for the depletion of the advance and indicating that the advance will be entirely depleted by the termination date of the contract. The use of gift cards and prepaid cards for the payment of goods/services at a later date is prohibited. The County does not utilize credit cards or procurement cards for the purchase of goods/services. Prior to including Special Items of Revenue/Grants in the Budget and forwarding same to the Division of Local Government Services, Departments shall complete a Special Item of Revenue/Grant Budget Insertion Request Form on the UC Grants X Drive program to insure uniform information is obtained and maintained for Audit purposes. Please refer to the attached Special Item of Revenue/Grant Budget Insertion Request Form as a guide to the information to be recorded on the program. Fiscal reports should reflect reconciled costs between salary allocations to actual time spent on grant activity. A standard percentage of an employee’s salary cannot be used to allocate costs. Reconciled time sheets must be filed monthly with the Department of Finance, Division of Reimbursement. All fiscal reports filed with a State/Federal Agency for reimbursement must also be filed simultaneously with the Department of Finance, Division of Reimbursement for auditing purposes. The Department of Finance, Division of Reimbursement must be notified of employees charged to a grant whose personal leave is greater than 5 or more consecutive business day The salary allocation may need to be adjusted to stay compliant with State/Federal guidelines. The IRS has adjusted all POV mileage reimbursement rates effective January 1, 2017. If use of a privately owned vehicle is authorized or if no County owned vehicle is available, the rate per mile reimbursed is $0.535 or as detailed in each applicable collective bargaining agreement. Employees must calculate reimbursable mileage based on the shortest and most cost- effective route between two destinations. This is the case even if the employee chooses another route. Commuting to and from work is not reimbursable. This mileage is considered commuter miles rather than business miles. The two destinations should be the office site where employee is regularly assigned and the temporary work related destination site. If an employee travels from home to the temporary work related destination site, reimbursement shall be on the basis of total travel costs from home to the temporary work related destination site or from the office site to the temporary work related destination site, whichever is less. To receive mileage reimbursement, employees must maintain a log of their business miles, and a copy of this information must be supplied to their Department. The log must include the date of the trip, the mileage driven and the reason for the travel. See the attached Mileage Reimbursement Request Log. Original receipts of tolls paid during business travel must accompany the log and shall serve as back-up to Purchase Orders. Employees will receive reimbursement for miles traveled and tolls only when the business travel was approved in advance by their Department Director and no County owned vehicle was available for use. Departments, Offices and Agencies of County Government are asked to complete the Access/Authorization to Edmunds Financial System Form to insure that only authorized users have access to the financial system. Please complete the Edmunds Financial System Access Form for each authorized user and return to the Department of Finance Attention: Linda Ferraro. Current users not authorized by the Head of their Department, Office or Agency will cease to have access to Edmunds. See the attached Access/Authorization to Edmunds Financial System Form. Payroll is processed on a semi monthly basis on the 15th and 30th of each month. Time is gathered at department level week by week. Payroll Liaisons have access to Primepoint where they can view, create worksheets and check reports for their departments only. Primepoint Grids: Primepoint worksheets have all the pay categories necessary and the payroll Liaison can enter all the employee hours or amounts into their department worksheet. This applies to County of Union salaried employees. Time clock external file import: Jail, Sheriff’s and Hospital have time clock These time clocks prepare a file that is placed into a designated network file. The payroll Supervisor imports the file into Primepoint. This applies to County of Union hourly employees. Once all the time is on worksheets and time imports are complete the Payroll Department will process a preliminary payroll. Primepoint users can extract Primepoint Reports to review payroll. Preliminary payrolls can be run as many times as possible until payroll is as error proof as possible. After the final payroll is processed all departments can run their own payroll reports to view it. The Finance Department receives checks and direct deposit stubs via FedEx the next day after the final run is processed. These checks are counted, sorted and distributed to the County’s payroll liaisons. The payroll liaisons will distribute the checks to the employees in their department. Upon scanning and completing a mobile deposit, write “electronically presented on (date)” across the top of the check to protect against duplicate deposits. Securely store the check for 30 days after it has been posted to your account After 30 days, you can consider the check to be void and securely destroy it. Should a payee attempt to physically deposit a check that has already been deposited electronically, the payee will be responsible for reimbursing the financial institution or check cashing store for the duplicate presentment of the check. Capital requests are submitted to the Department of Finance beginning each Fall of every calendar year for the next calendar year during the annual budget process. Environmental remediation that is part of a larger capital project (i.e. remediation on the removal of underground tanks) is permissible. However, a sample air test in a building just for the sake of testing is not considered a long-term capital project. This would be a short term test (sample) and would not be permissible to charge capital funds for this purpose. When using capital funds for a purchase, a capital request form should be submitted to the County Manager’s office for approval prior to a requisition becoming a purchase order. Once the Department has the authorization form signed, it should be attached to requisitions in the financial system so that Finance can review for determining account usage. Once reviewed, Finance will give 1st approval if the proposed capital account matches the purpose of the purchase and there is sufficiency of funds. The requesting Department and Purchasing will complete 2nd and 3rd approvals respectively. Although the Capital Budget is included with the County’s annual adopted budget, the capital accounts and budget do not become effective until a Capital ordinance is adopted sometime after the annual County Budget. Finance will assign account numbers for new capital accounts and distribute to the respective departments once the ordinance takes effect (usually 20 days after the adoption date). This policy sets forth requirements to be followed by employees and provides guidance for compliance with industry standards for credit card processing. The establishment of control measures for credit card sales/receipts transactions is necessary to maintain proper security over credit cardholder information. The Division of the Treasurer requires each location (i.e. Constitutional office, Department or Division) be approved and set up as a credit card processing merchant and each method of processing credit transactions. Finance, County Counsel and Purchasing approval before entering into any contracts or purchases of credit card processing software and/or equipment This requirement applies regardless of the transaction method or technology used (i.e. e- commerce or point-of-sale device). Comply with procedures for safeguarding cardholder information and secure storage of data. This pertains to ALL transactions over the counter or via internet. Complete an annual security self-assessment questionnaire provided by Security Metrics or a comparable merchant data security and compliance company. Compliance with Payment Card Industry (PCI) Data Security Standards. Any management with responsibilities for utilizing Union County credit card transactions, and those employees who are entrusted with handling credit cards and credit card information must be familiar with, understand, and comply with this policy. Review and approve the establishment of new department (or additional) credit card accounts and/or processors. Administer the process of obtaining new Merchant I.D. numbers. Conduct periodic reviews of existing departments regarding safeguarding and storage of cardholder information. Collaborate with the Division of Information Technology to complete the annual security self-assessment questionnaire. Keep secure and confidential all cardholder information. Credit card receipts should typically be treated the same as you would treat cash. Ensure the Department/Constitutional office does not store or retain credit card numbers after processing. Ensure credit card transactions are only conducted on secure computers or other authorized devices. A quarterly scan will be conducted by Security Metrics to ensure the network is non-compromised. Sensitive cardholder data (i.e. full account number, type, expiration, and track (CVC2/CVV2) data, CANNOT be stored in any fashion (paper, computers or networks, etc.). Credit card numbers must NOT be transmitted in an unsecure manner, such as by e-mail, fax or traditional mail. Credit card receipts should be kept in secure environments such as locked drawers, file cabinets in locked offices, locked storage facilities and safes. Establish appropriate segregation of duties between credit card processing, the processing of refunds, and the reconciliation function. Perform an annual self-assessment to ensure compliance with this policy and associated procedures and report results to the Division of Treasury. The daily sales settle electronically into the appropriate bank account, usually within 48 hours. It is the responsibility of the Department/Constitutional Office to close out credit card batches daily. It is the Department’s responsibility, in cooperation with Finance, to reconcile the settlement amount in the general ledger account to the credit card receipts on a regular basis, but no less than monthly. Each Department receives a monthly statement directly from the merchant service provider. These statements provide a listing of each batch submitted for reconciliation purposes. It is each department’s responsibility to verify that this information is correct. If the department is not receiving such statements, please contact the Division of the Treasurer. Fees – each transaction is subject to interchange, discount and per item fees charged by Visa, MasterCard, Discover and American Express. Additional fees may be assessed by the authorized merchant service provider based on the RFP process. Examples include monthly maintenance fee, chargeback fees. Merchant Service Provider – The current processing provider for the County of Union is TD Merchant Services (First Data). See Resolution #940-2015 adopted December 3, 2015. If you are interested in further training on any of the above matters, please contact the respective Finance Division to coordinate a time to meet or speak further.